Delta Force Paintball Surrey is the answer to the ultimate paintball experience! With two state-of-the-art paintball centres available based only a few yards apart, paintball fans living in Surrey can experience paintballing at its best! 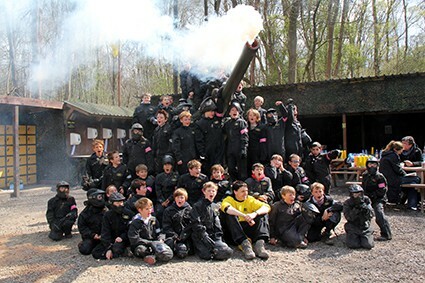 Set amongst lush woodland, our Surrey Paintball centre features 8 exciting game zones for customers to explore. The latest addition to the list of first class game zones is London Town which includes several original London double-decker buses, genuine black cabs and a replica Big Ben, and also Space Warz; an intergalactic themed scenario complete with a 30ft replica Imperial Shuttle surrounded by Scout Walkers. Other exciting game zones at the Cobham Paintball Centre include The Haunted Graveyard, Castle Wallenberg, Tomb Raider, Command Post, Viet Cong Village and Mad Murphy’s Jungle Attack. Players can also add a bit of panache to their game by using a range of paintball pyrotechnics including smoke grenades, paint grenades and Mk5 thunderflashes. Delta Force Paintball Surrey features top-class facilities at basecamp, to ensure your time spent with us is as comfortable as possible. We have open and sheltered picnic areas with lots of seating available and secure lockers for guests to store their belongings (for a small charge). 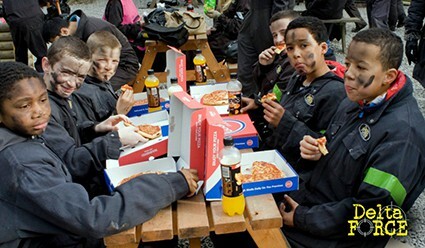 Guests at our Cobham Paintball Centre also have the option to enjoy hot pizzas at lunchtime, freshly prepared by a local offsite catering company; just order in advance at the time of booking or on the day of your event (before 11am). In addition to Delta Force Paintball Surrey is our paintball centre in South West London, located only a few yards away in Effingham. 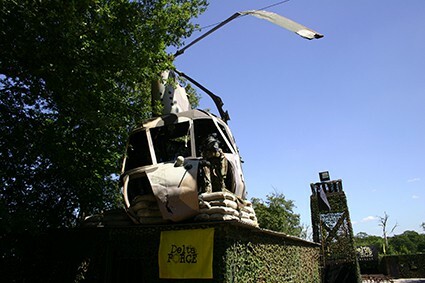 The South West London paintball centre features 7 thrilling paintball game zones, such as: Viet Cong Village, Command Post, Chemical Alley, London Apocalypse, Mad Murphy’s Jungle Attack, Castle Wallenberg and A Bridge Too Far. A massive artillery gun also takes prime position at base camp, which always makes a great focal point for team photos!